Item: Please Choose OneLionGator Personalization Type: Please Choose OneNoneMonogramSingle InitialName/Phrase Initial Monogram or Name: Font Type: Please Choose OneNoneDiamond (monogram)Circle Script (monogram)FishTail (monogram)Block8Block107Script10Script51EScript51A#15A Font#40 Font Thread Color: Please Choose OneNoneEmbroiders ChoiceGreenBlueYellow Who is this item for? 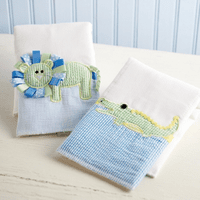 These adorable burp cloths will make any mess cute. Each burp cloth is made of diamond weave fabric. Shop BayberryMonograms.com in complete confidence. You are protected by the world class security of Yahoo Secure Shopping. Copyright © BayberryMonograms.com and Bayberry Monograms Ltd., 2005. All rights reserved. Images used herein are protected by copyright of either BayberryMonograms.com, the manufacturer of the goods, or stock photo agencies and cannot be reprinted or sold without the written permission of the copyright holder.